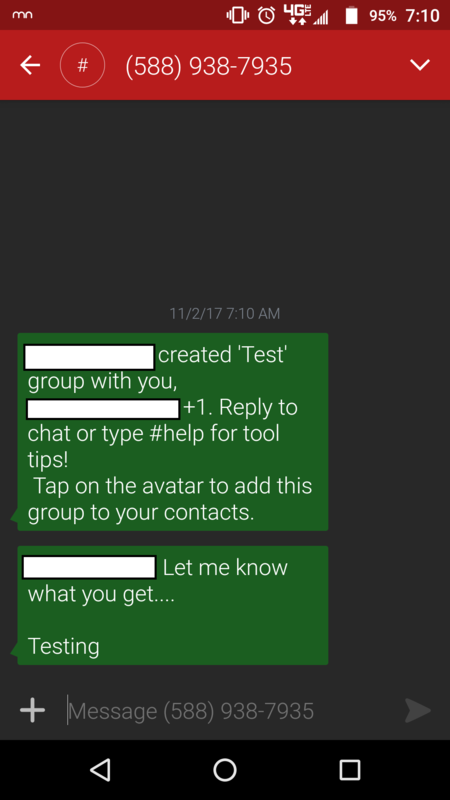 If someone creates a group message inside the Verizon Message+ application, I do not receive them. The only way I knew these group texts existed is because the person who created the group asked if I was getting them and I received a strange message one time. SENDERPHONE#: Messages are waiting for you. Download Message+ to read these messages at https://www.vzmessages.com/getclient. I then opened the Message+ application and saw the group text and all the messages that were sent. I never received these with the default Android app or Textra (my preferred texting app). I do receive individual texts, and group texts from other people, but it appears that if the text is sent from the Group Message inside the Message + app, I never get it. This happened again, with a family member who created a group text using Message+. I never got it nor did the above message come through like it did once before. I only knew the group text existed when my sister asked if I got it. When I opened Message+, there it was! It is always important to make sure that you receive all your group messages IamNivek. We are not able to guarantee that your messages will go through a 3rd party application but you should get them on your preinstalled text messaging app. How long has this been going on for? What is the make/model of your device? Is anyone else having this issue? I have a Moto Z Force with Android 7.1.1 installed. I'm not sure if anyone else is having the issue. It does not matter which application I use, the group text does not even show up. I can only see it with the Messages+ app. This has been happening since at least the beginning of August, that's when I first realized I wasn't getting the messages. I've been trying to figure it out and different apps, settings, etc. to no avail. IamNivek, ensuring that you're able to send/receive group text messages with your mobile device is very important. I use the same mobile device that you're currently using (Moto Z Force with Android 7.1.1installed). Just as mobile phone's software versions update, apps will too. I experienced a temporary issue with group texting, very similar to what you're experiencing. To resolve this matter, I simply checked the app version for Verizon Messages + along with checking to make sure all of my messaging apps (I used multiple apps on occasions) were up to date. If my response answered your question please click the �Correct Answer� button under my response. This ensures others can benefit from our conversation. Thanks in advance for your help with this! Thanks for the info. I checked the default messages app for Android, Textra and Message+. They are all at the latest levels and are set to auto-update. In the default app and in Textra, I don't have any indication of a message from the group. Other than the message I received once (see original post), I get nothing. I have even uninstalled and reinstalled and disabled / re-enabled the apps and cleared the cache/ settings. None of this has helped. The person sending the texts is using an Android phone and the Messages+ app to send. The crazy thing is, when other people reply to the group, I still don't get those texts, either. As a test, I created a group message with myself and a couple members of my family using Message+, they all received the same message I posted in my original response, but nothing after that when I sent a couple more texts to that group. I then texted the same people using both Textra and the default Android messaging app and everyone received the text just as I sent it. It definitely seems to be related to the Messages+ app from all my testing. I have had other people say the same thing. I think it is related to having to add a "Group Name" in Messages+, but I can't test that because it is required and no way to add members and just send it with no title (at least that I can tell). It sounds like you've taken some great steps so far. And we're not giving up here. Thanks so much for the additional information. Let's try this, can you please place your device in safe mode by following the steps in this link: http://vz.to/2fuSI3k? While your device is in safe mode, please attempt to test the group message in your Verizon Messages + application. Do you have any luck with your receipiants receiving your message? Are you able to receive any responses? We will be standing by. Ok, I did that and here are the results. MYCELL# created a 'Test' group with you. RECIPIENTS CELL # +1. Reply to chat or type #help for tool tips! Tap on the avatar to add this group to your contacts. My son replied to the group text, and I received it in Messages+ application only. I switched to the default Messages app for Android while in Safe mode, the reply to the group, or my text to the group was not in the list. See the Screen Shots. 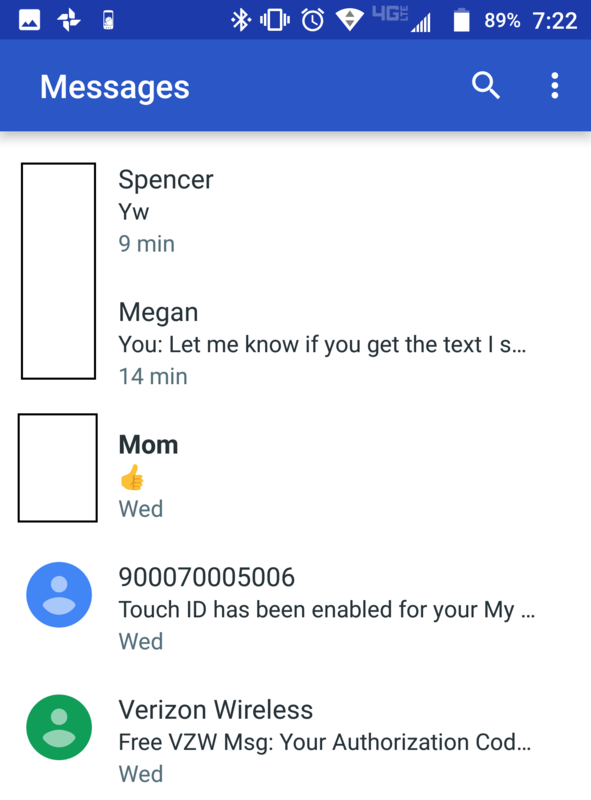 The first one is from my son that uses "Textra" messaging app, the second one is my Messages+ app, and the 3rd is my default Android Messages app where you can see there is no group message displayed in the default app. It only shows up in Messages+. 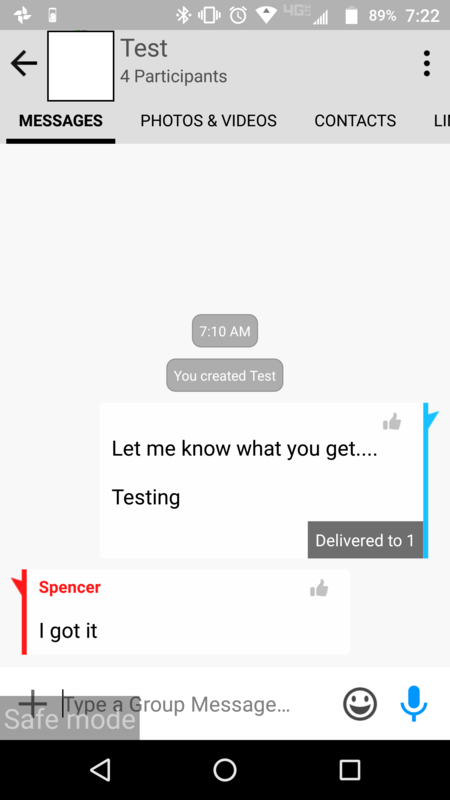 Default Android Messages app, no group text, just the individual texts I sent letting them know I was sending a test group message. I know how important it is to be able to maintain group messages. Does she get group messages from anyone else? Also, because group messages send as MMS messages, if you send her a picture, does she receive that as well? Does she have trouble with data? She does not recall ever having any issues with other group messages.